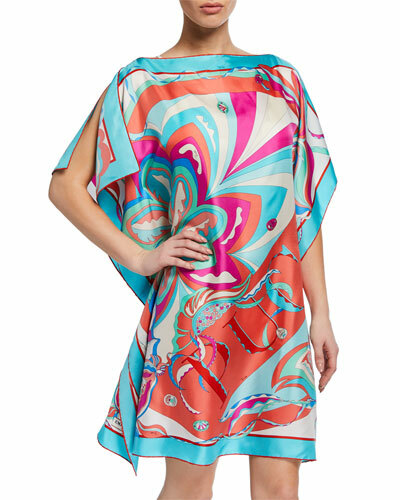 While Emilio Pucci is best known for its vibrant, psychedelic take on paisley and prints, the designer for whom the label is named began his journey designing a streamlined ski outfit in 1947. Soon after, Pucci started working closely with fabric manufacturers in Florence, Italy to invent revolutionary stretch fabrics that would change the way women dress, especially for travel. The patented stretch silks and cotton jerseys were lightweight and packed easily, making Pucci dresses and robes staples for coastal vacations throughout the 1950s and beyond. Today, the designer’s family retains stake in the brand, ensuring the legendary Pucci quality is upheld. 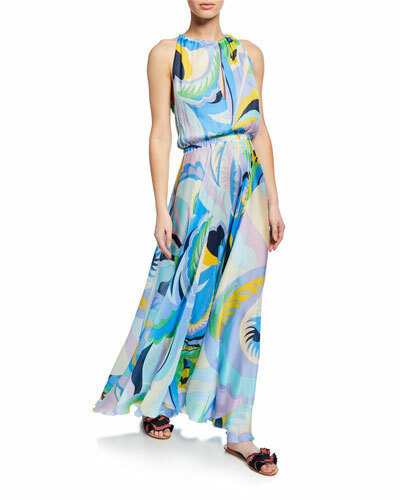 Find swimwear and apparel from Emilio Pucci at Bergdorf Goodman. 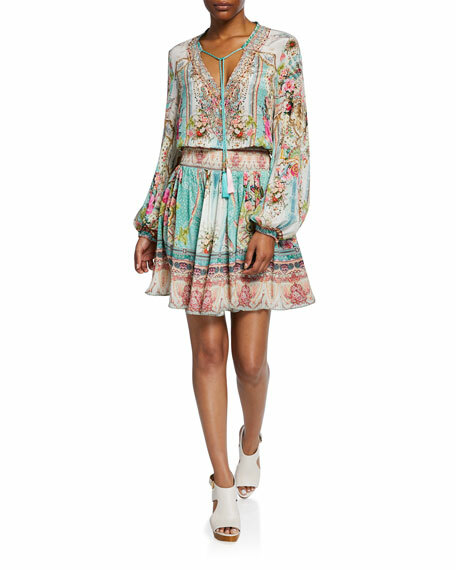 Camilla embellished crepe coverup dress featuring "Hani Honey" print. Plunging neckline with self-tie detail at center. Spaghetti straps. Fitted bodice. Seam across waist. Flowy, A-line skirt. Ankle-grazing hem. Pullover style. Silk. Imported. Exclusively ours. 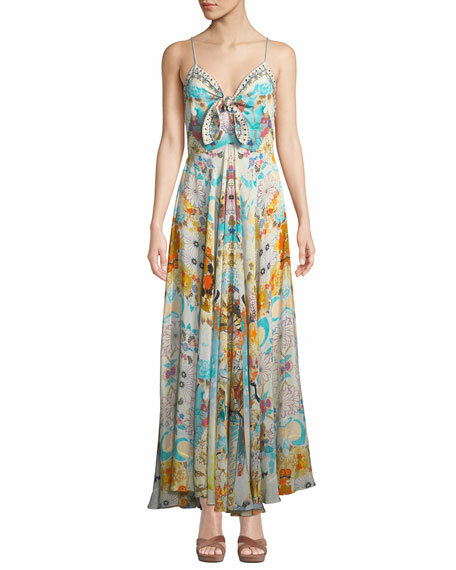 Camilla dress in printed silk with crystal details. V neckline; tassel ties. Long sleeves; cinched cuffs. Smocked waistband. A-line silhouette. Hem hits above knee. Slipover style. Imported. Isabel Marant "Telicia" dress in linen with ruffle details. Scoop neckline. Long sleeves. Self-tie belt at waist. A-line silhouette. Keyhole back. Flounce hem. Mini length. Machine washable. Imported. 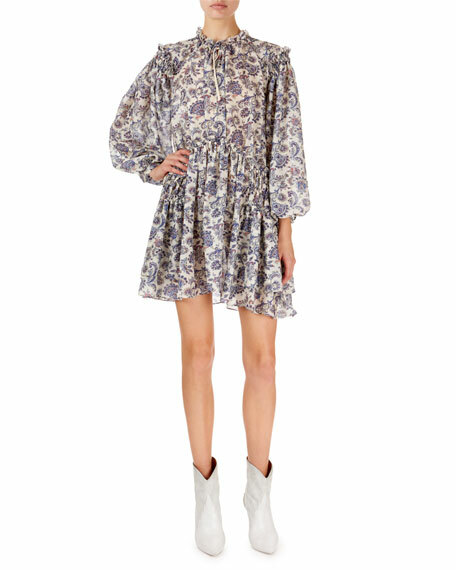 Isabel Marant dress in paisley georgette with ruffle trim. Frilled mock neckline with tie. Long bishop sleeves. A-line silhouette. Optional self belt. Mini length. Silk. Imported.